On Thursday I had a little energy...go figure! I picked some very nice tomatoes and cucumbers and made a Bruschetta. 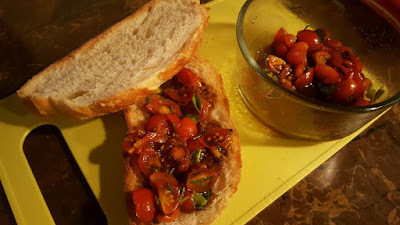 It was extra sweet because of the cherry tomatoes and tasted lovely on my homemade No Knead Bread! 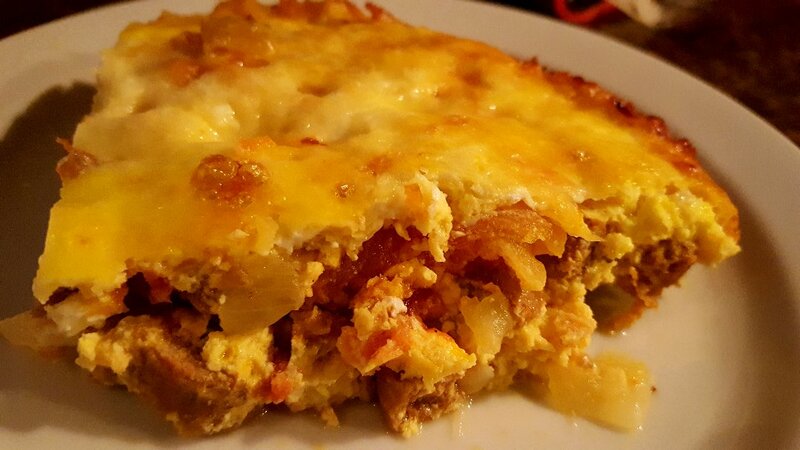 I had some eggs to finish up so I made my Sausage and Tomato Frittata for dinner. 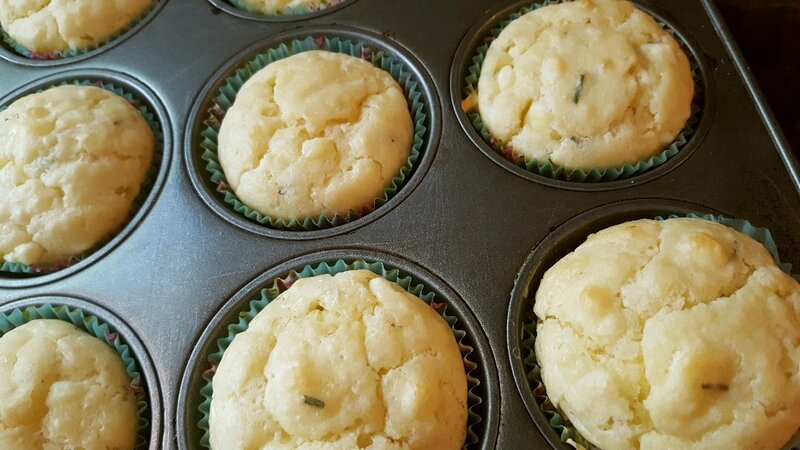 I also found a recipe for Feta and Chive Savoury Muffins in my Taste of Home cookbook. They turned out well, but a little bland. Next time I'll add more chives. I guess the "Award Winning Recipe" label is very subjective!! For our sweet tooth, I made a batch of Double Chocolate Chunk Cookies from Martha Stewart's website. 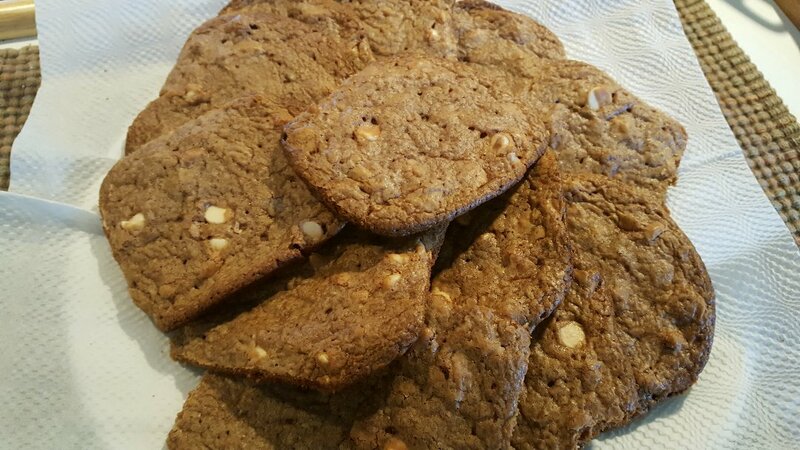 I used white chocolate chips instead of chocolate chunks though. They turned out delicious but completely melted while cooking...melted, not sure how to describe it, but they kind of amalgamated and flattened, and turned into one big cookie! I wanted to make sure we had plenty of snacks during the next few days since I'm kind of overwhelmed with chores to do. Despite how busy I've been with the dogs, it felt WRONG not making any cheese this week, so I made a quick Microwave Mozzarella. 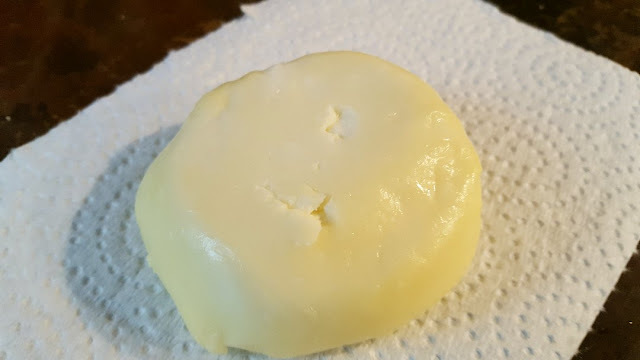 This cheese is SO fresh and yummy and super easy to make. We've been snacking on it the last few days. Alex said we should age this cheese. I said, "it's supposed to be eaten fresh and we can't age it." He asked "why not?" Why not indeed! I was just always told fresh Mozza cannot be aged...but why not? So...this is one day in the cheese cave drying it. I sealed it today and we have an experiment on our hands! 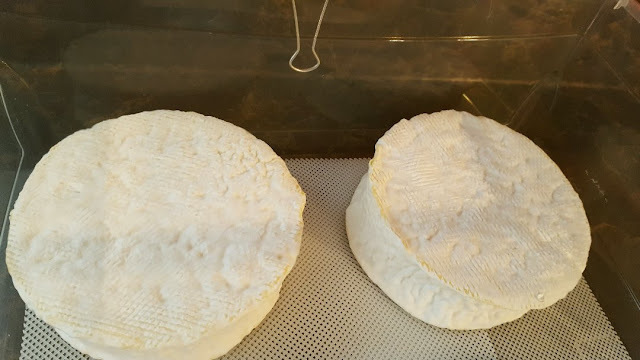 I've successfully aged the Traditional Style Mozza, so I'm going to wait a month or so to see how this little bundle ages! The Camemberts smell divine and are getting mouldier and mouldier each day! By the end of this week, I'll be wrapping them and they'll sit for another 4-6 weeks before we try them! Since Thursday, we have had freezing temperatures overnight and frost. 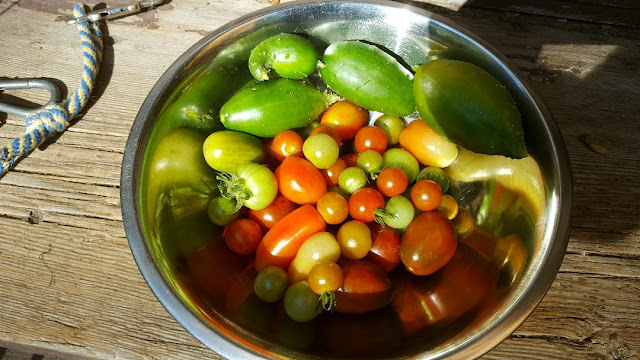 I decided today to pick the last of the tomatoes, ripe or not. And the last 4 mini cukes. The veggies that aren't ripe will sit on the window sill for a few days so we can salvage them! The summer garden is done. What can I say? It's been a bit disappointing, but I can only blame the weather this season. I did learn a lot for my first container garden though. 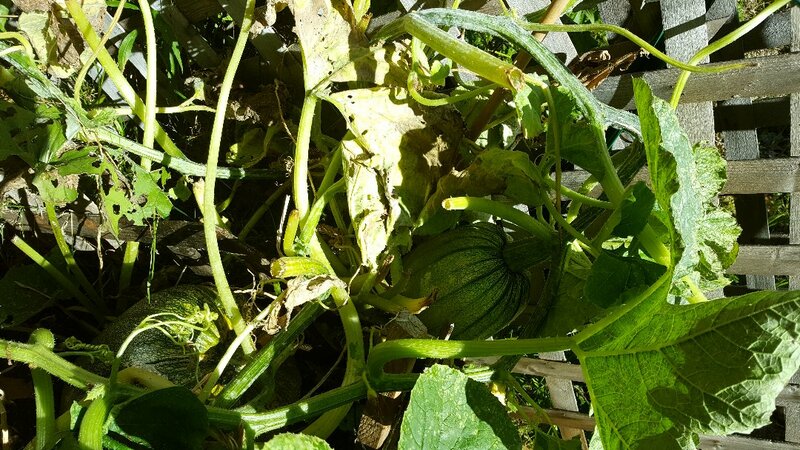 These two pumpkins are still green and may possibly be orange-ish in a month's time for Halloween. I don't think I'll be participating in this week's Year of Projects post on Sunday; nor the Scribble Picnic post on Wednesday...I'm just off my rocker with the dogs and Monday's impending shopping trip! I did a full pantry and freezer inventory yesterday. I have 24 of 31 meals planned (including our Thanksgiving!! )...the next step is to finish the meal planning, make my shopping list, check the flyers, write the final shopping list with estimated costs...then sit back and have a glass of wine...patting myself on the back lol! This week, I must also clean up the dregs of the summer garden and prepare for my winter garden. We have to get some plexiglass for cold frames, build some raised beds to keep the garden as protected as possible, and put them all together. I have to plant my garlic too. For now, the pumpkin patch will stay put until November. And during all of this I'm hoping I can make a Swiss cheese and start some much needed slippers! It's getting darn cold out! I will miss all of my Blogger friends over the next little while, and I will catch up with all of you next week. I love my routines, and reading blogs each morning while I sip my coffee is such a pleasure - MUCH better than reading the news and social media! Oh...and there's the dogs too...oh my, how did my simple quiet little life get so hectic all of a sudden?? ?...like I said, I'm off my rocker!!! Ha! I'm off my rocker too, but only 2 dogs. With my daughter out of commission, I have total dog duty. It's been crazy busy. A frost? Oh how alarming, but glad you got those garden goodies out to enjoy. That pumpkin looks wonderful! Mmm! Everything looks so yummy. I'd like to try everything, pls! Now I am hungry, I shouldn't look at your blog until after supper! As we used to say in our family "it's not easy being cheesy" but it takes on a whole new meaning with you! LOL! I don't know how you do it.....but I am so glad you do as you are an inspiration to me and many others I'm sure! You did a wonderful job on your container gardening this year....mine stunk! LOL! But I tried and next year will be better. I wish we had a frost but at least it is in the 80's F now instead of so hot you can't stand it. We need rain badly or they'll be out with 'fire danger' warnings and that makes me nervous. Your bruschetta looks wonderful and I used to make the no-knead bread but it was a little hard on my teeth and jaw. I love Italian and French style breads...it was what I was raised on. I still make it every once in awhile. The cheeses look great and the microwave mozzarella sounds like something I should try. Those cookies look good too...I do have a sweet tooth. Your 'queen' pumpkin is much bigger than mine. I picked it and there are 2 more but they are very small. Off your rocker, but still on the ball! You're so very organized and on top of all you want and need to do that I wouldn't worry your little head about anything during this coming very busy week you have coming up. You always get one heckuva lot done and it's inspiring to read of and learn from your plotted out life . . . that still allows you to get done A LOT even with the extra animals in your care. You can be very proud of your gardening efforts this year. From all I'm hearing, it was a strange year of growing for nearly everyone, but even so, look how successful your efforts were. We haven't had a frost yet but everything in my garden seems to be winding down (or coming to a stand still) earlier this year than normal. My plan is to go with it, not stress about it, and be ready for this coming winter season all the sooner. Bring it on! I'm ready!! HAHAHA...oh, Rain, you do make me smile :) You have such a wonderful sense of humour and such an upbeat attitude. And every time I visit your blog I'm hungry and exhausted! LOL So much good food at your place. And so many chores!! I've no idea how you keep up with everything. Considering the lousy weather we had this year, you did very well with your garden. I especially love that pumpkin. Can't wait to see it in all its orange glory! Hope you are enjoying a lovely weekend. Gosh it must be fun at your house with all the good eats all the time! Catch up with you soon when you get back from your other priorities! Aw, the end of the garden is always a sad time of year. But your pumpkins look fantastic! You did really well with this garden, despite all the challenges. As usual, your blog posts make me hungry! I love that you've become such a cheesemaker. My fridge is full of several gallons of milk that need to become cheese today. Still working on our supply of mozzarella, for the two months after I dry the goats off before kidding. 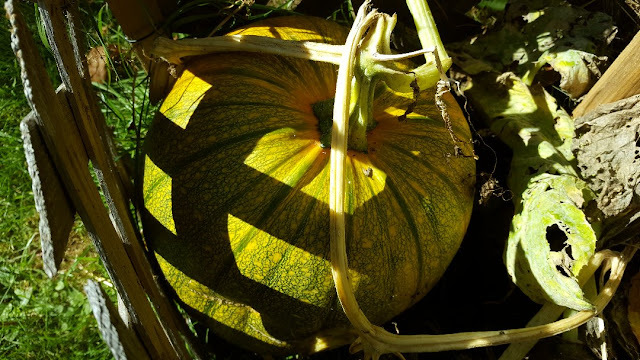 Great looking pumpkin. Bet you will make a great pie or something with that. Loving that you make the cheese. Great job. Good Golly Miss Molly.....................You are one busy person. Planning 31 meals at a time. I am impressed! What an inspiration you are to me. I love how organized you seem to be and having 5 dogs while doing all you do? Yup, you deserve an award. Your microwave mozzarella makes me want to give that one a try. We love cheese and since it is on the list of things hubby can eat.........we eat quite a bit of it. I am anxious to see how you do with the swiss. That is my favorite cheese. What is the difference between making baby swiss and swiss? Love the no knead bread and had made it quite a bit before we had to switch flours. I might have to give it a try again with our spelt flour and see how it does. We love the crusty breads. Your pumpkin is so pretty and I hope she continues to ripen for you for the next month. I hope you get those slipper done so you and hubby's toes will be nice and toasty. We are still wearing sandals here as our temps are still in the upper 90's. The garden ending is always an "aw, dang it...." moment but you've had some great harvests. And wow, the pumpkins are doing great. Pumpkin pie perhaps? 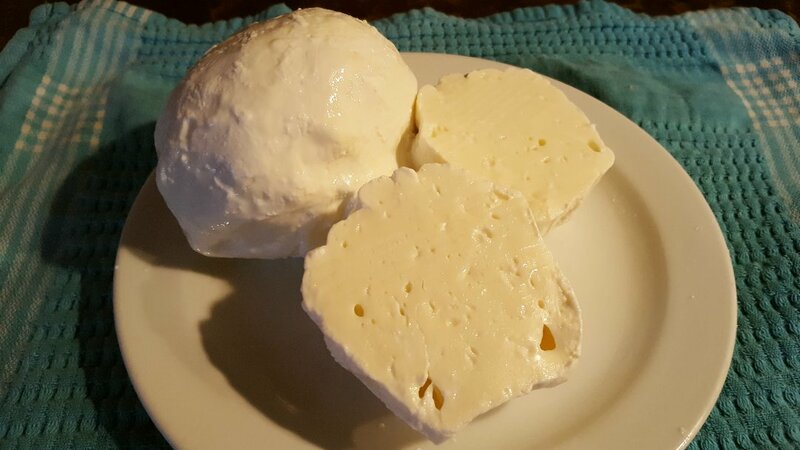 Love your passion for cheesemaking. It's inspiring and I might just have to bite the bullet soon and try. Maybe it's a good Winter project (since our winters are so mild). Enjoy that well earned glass (or two) of wine!! That is one beautiful pumpkin! There's so much to do this time of year, even without almost double the dogs and your giant shopping trip to look forward to! I had the first frost this morning, so will be busy getting my Meyers lemon tree in, along with any other potted plants I want to overwinter. I always look forward to your amazing recipes - and great photos! I harvested my pumpkins on Saturday. 11 total. Well, 10 actually and a baby pumpy. 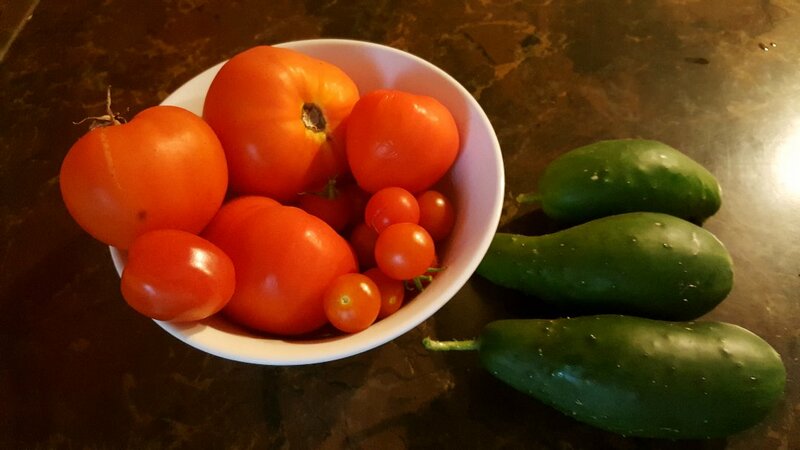 :) Pleased with my harvest this year. Of pumpkins anyway! each dish you prepared is watering my mouth lol although i just had breakfast ! you are so incredible to do lot in a day! what delightful harvest! It's okay to have not as much expected yet you succeeded with this bucket full of veggies my friend! Yes i missed your art but hope in future soon as you "to do list" sounds tiring to me . best wishes for giveaways and gardening works. Busy busy busy!! Love seeing your updates! The frittata looked amazing! I am impressed with you having so many meals planned! I don't even know what I am having tonight. My wife is making a big stew for us in the crockpot today. The weather is cooling down, and we love to have something good in the crockpot so we can just eat when we want to. Glad all is well up there with you , Rain.